I wondered if I should call this recipe Death by chocolate because if you’re going to die by eating chocolate, this is the way to go. This is pure comfort food. Actually, it’s not really a food. And I should definitely not be sharing the recipe with you, but I know that there’ll be a time later on when I’ll want to know exactly how to make these brownies. And the easiest way for me to find it is here on Sparkling Adventures. 1. Preheat oven to 160 degrees C. Grease a large baking pan. 2. In saucepan over very low heat, melt butter or margarine and chocolate, stirring the mixture constantly. Remove from heat, and stir the sugar into the chocolate. Allow the mixture to cool slightly (this is so the eggs don’t cook when you add them). Beat in the eggs one at a time, mixing well after each, then stir in the vanilla. Combine the flour, cocoa and salt; stir into the chocolate mixture. Fold in the walnuts. Spread the batter evenly into the prepared pan. 3. Bake in oven 45 minutes. 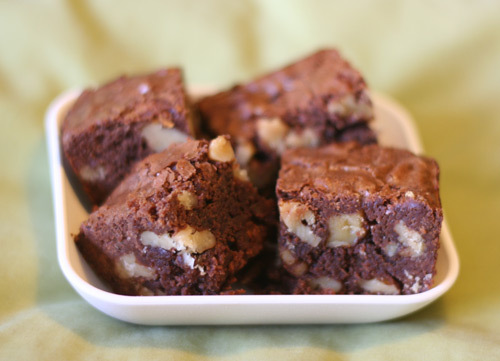 Brownies are done when a toothpick inserted into centre comes out clean. Cool in pan on wire rack. Do you think that these edits are necessary for today’s readers, or does it mean the original is violated? (And what other books are being edited for modernity’s sake?) Yikes! Glad we finally got the recipe to work! I’ve successfully made this, substituting chia seeds for the eggs. I used 4 tbsp chia seeds, soaked in 1 cup of cold water for half an hour. Hi, I was Googling “Superfudge” and came across your blog. Yes, I read the original and cannot stand the updated Christmas list and Fudge watching Cartoon Network. But they also left in a few outdated references. The scene where Fudge pastes the trading stamps on Tootsie in hopes of trading her in for a two-wheeled bike, and when Mrs. Muldaur (sp?) gives the boys homemade cookies when they go to trick-or-treating at her house on Halloween. They also leave in the part where the boys go to the cinema to see “Superman.” Trading stamps went out around the beginning of the ’80s and, around that same time parents began telling kids not to accept homemade or unwrapped treats while trick-or-treating. (Fudge also mentions getting four apples in his trick-or-treat bag). it makes no sense to have references like this in a book that references laptops, MP3s, CDs and Cartoon Network.